Not a whole lot of knitting got done around here this week. I’ve been working like crazy on getting Shawl Geometry III ready for it’s upcoming debut. But a little knitting isn’t the same as no knitting. 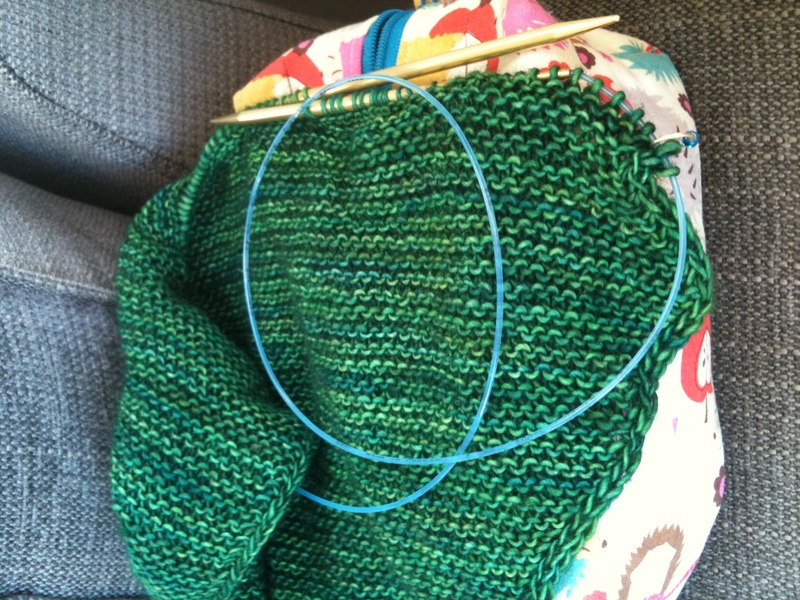 I passed the halfway point on my green garter stitch shawl. I love reaching the halfway point in side-to-side shawls, because now the rows are getting shorter, and the knitting is going faster, and eventually zoom! it’s done. That is, if I ever get more than an hour or two a week to work on it. Some knitting better than no knitting for sure. Because at some point, after knitting a row at a time, you’ll pull it out and almost be done with it. Good luck finishing! The shawls are a big project, row by row it’ll get finished.